Fast forward about sixteen years; a good friend of my grandmother entertained the family with some amazing violin playing. He could play classical, fiddling improv and everything in between. I suppose that was my first inclination toward the instrument. I have a photo of me holding my brand new starter violin complete with foam shoulder rest for his approval. So I called every number in the phone book (the physical book) to find a violin teacher. As it turns out, not many violin teachers were advertising in the phone book circa 1998. They most certainly aren’t now, I suspect. 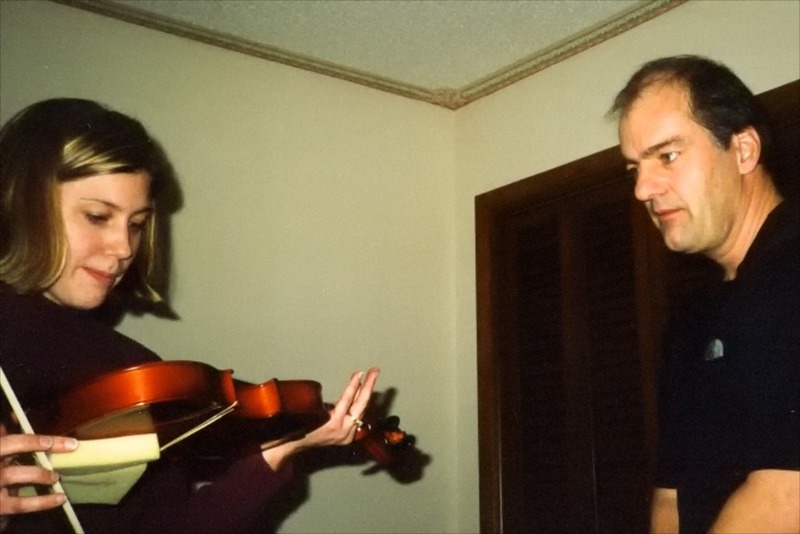 Fortunately I found an instructor (and now dear friend) of the Suzuki Violin Method. I plowed through Suzuki Violin Books 1 & 2 with zeal. Book 3 slowed me down considerably because I had already reached my watershed piece, the Gossec Gavotte, at the end of Suzuki Book 1. I kept playing and joined a few other adult players at Violin Camp over the summer and it has been a support group of sorts. In 2002, my soon to be step-daughter took interest in playing and made it to the beginning of Suzuki Book 2 when the flute caught her attention. I’m working desperately to learn the second violin part of the Bach double to play with another adult student at the recital in May…. and there’s my personal history of life as an adult violinist part I. You are currently browsing the archives for the Violin in Minnesota category.